During the past few years, several companies have closed some of their retail stores due to a low number of in-store sales. Consumers have been online shopping more, which has lead to a decrease in the amount of individuals that will physically travel and shop at a store. Companies are searching for alternative methods to draw in customers and resolve this issue. So far, multiple companies have found success in implementing augmented reality (AR) technology. The integration of augmented reality (AR) technology has changed the retail world and will continue to do so in the future. 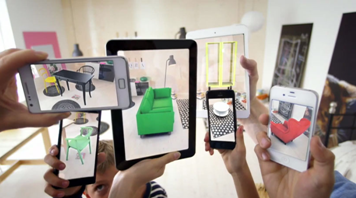 Major companies, such as Ikea, Zara, and Sephora, have already engaged in implementing AR in mobile applications or in technology within their stores. AR provides consumers with innovative technology to determine how a particular product, such as clothing, furniture, or makeup, would look like before purchasing it. Eligible costs include U.S. employee wages, cost of supplies consumed in the R&D process, cost of pre-production testing, U.S. contract research expenses, and certain costs associated with developing a patent. Two of the main AR platforms utilized for mobile devices are Apple’s ARKit for iOS devices and Google’s ARCore for Android devices. Both of these platforms contain the same functionalities with slightly different features. ARKit offers motion tracking, environmental understanding, and light estimation features. The motion tracking feature tracks a device’s location by using a visual inertial odometer which is comprised of a device’s camera tracking and motion sensor data. The environmental understanding functionality within a device is used to examine an environment through a camera lens to establish where existing structures are located. Lastly, light estimation uses a mobile device’s camera sensor to measure the available light in an environment. ARCore offers the same three main functionalities as ARKit, but contains a difference with the motion tracking feature. In ARCore, motion tracking utilizes inertial measurement unit data to establish space and the environment. Besides the three main functions, the platform contains additional features, such as hit testing. Hit testing tracks certain areas within a room which allows users to establish and track an object’s location and positioning. According to a study that was conducted, the most popular retail sector which utilized AR was furniture, followed by clothes, food & beverages, footwear, cosmetics, jewelry, and toys. It also found that a majority of customers would shop more and prefer to shop at stores containing AR technology. Some reasons why this technology is favorable by consumers is users can easily find out more information about products, experiment with different styles and colors of a product before purchasing it, and possibly receive deals or promotions on an item that they are looking at. Zion Market Research estimates that the global market value for the AR industry will most likely reach 133 billion by 2021. A large portion of this market growth will most likely be influenced by the development of retail AR applications. Ikea recently released a mobile application called Ikea Place which provides consumers with the tools to examine various types and designs of furniture products. 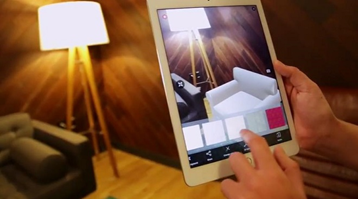 The application was built on Apple’s ARKit technology and was designed to showcase furniture in 3D with their accurate measurements. More than 2,000 products can be selected for users to examine on the application. To begin using the application, an individual uses a mobile device to scan the floor within a room and then selects a product listed in the app to place into the room. Lowe’s has an Innovation Labs team who invested a significant amount of time and money to develop several AR applications. Some of the applications created include Lowe’s Vision, Envisioned by The Mine, Measured by Lowe’s, and Lowe’s Vision: In-Store Navigation. The applications offer a variety of features such as the ability to measure certain dimensions of a room or pieces of furniture and view potential furniture products within a space, as well as a navigation guide to finding specified items within a retail store. All of these apps provide individuals in obtaining a better visualization between space and potential furniture pieces. Sephora has launched a Virtual Artist application allowing individuals to experiment with various shades of makeup regarding lipstick, eyeshadow, and more. The application was developed by ModiFace, which utilizes a smartphone camera and an artificial intelligence color match tool. The app uses the mobile camera to detect an individual’s face shape and features. The application then activates a color match tool to find various beauty products for users to examine and virtually try on. If a user likes how a certain product looks, it can easily be purchased directly on the application. A well-known retail clothing store, Zara, has stated it will introduce augmented reality systems in 120 stores worldwide with seven of these stores located within the United States. Zara’s mobile application can be utilized by scanning images on the company’s website, in-store podiums, and boxes received from online orders. Once an image of a product is scanned then a seven to twelve second animation of a model showcasing the product is displayed. AR technology provides customers with a fun engaging experience while at the same time allowing them to discover new products available at a store. Due to these factors companies will increasingly integrate AR into their stores. Companies involved with designing and developing AR applications are eligible to obtain the Federal R&D Tax Credit.